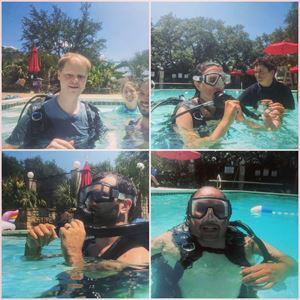 This photo shows many of our campers wearing scuba gear as they took their turn learning how to scuba dive in the pool. 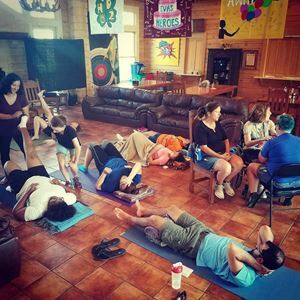 This photo shows many campers and SSPs laying on the floor doing yoga moves. One of the many activities the campers may choose to enjoy. This photo shows Camper Patsy riding a horse while wearing a safety helmet. 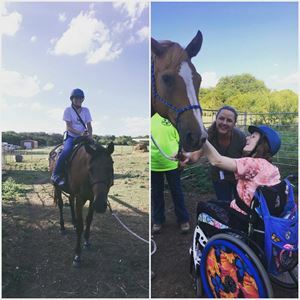 And one photo shows Camper Amanda and SSP Kerrie petting a beautiful horse and both are smiling. 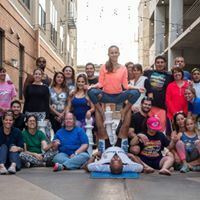 This photo shows the many, many DeafBlind and SSPs that came to an acroyoga class led by Tanya, a DeafBlind young lady doing an acroyoga pose. 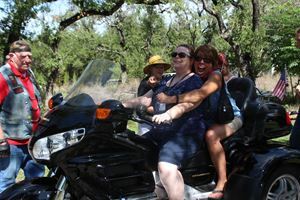 This photo shows Board Members Kim and Jacqueline sitting on one of the many motorcycles rode by Campers, SSPs, and Camp Staff. Both are smiling!